Powers/Abilities: Hiram Shaw possessed unspecified magic abilities, including projection of mystic bolts. Though seemingly ineffectual in a direct confrontation with Dormammu, who apparently could not simply kill him, he was able to provide (or maintain) wards that prohibited Dormammu from entering the Earthly plane. Hiram believed himself to be God's sanctified agent, sent to punish the wicked for their sins. 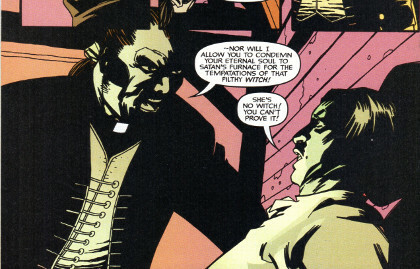 (X-Men: Hellfire Club#1 (fb) - BTS) - In his native England, the Reverend Shaw dutifully served as a minor clergyman and exorcist of little acclaim. God and poverty were his masters, and for most of his adult life, he accepted his meek station, confident he would someday inherit the Earth. Unlike most men of the cloth, an insatiable hunger for power burned within Hiram Shaw. 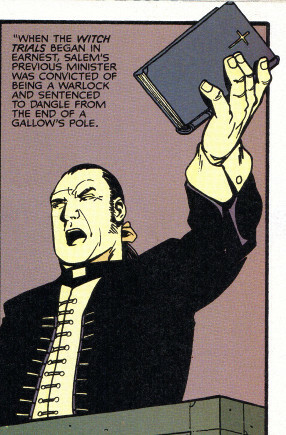 (X-Men: Hellfire Club#1 (fb) - BTS) <1692 AD> When the Salem Witch Trials began in earnest, Salem's previous minister was convicted of being a warlock and was hanged. The frightened people prayed for someone to come and rout the evil festering among them. The Reverend Hiram Shaw was the answer to almost everyone's prayers. (X-Men: Hellfire Club#1 (fb)) - Hiram Shaw presided over and encouraged the pursuit and eradication of witches in Salem. (X-Men: Hellfire Club#1 (fb) - BTS) - Hiram Shaw barred the passage of the mystic demon Dormammu from his Dark Dimension into Earth. (X-Men: Hellfire Club#1 (fb) - BTS) - Hiram Shaw suspected Abigail Harkeness to be a witch, and he did not want his son, Obadiah, to associate with her. (X-Men: Hellfire Club#1 (fb)) - The congregation -- with the exception of his son, Obadiah -- gave a standing ovation after one of Hiram's presumptive "fire and brimstone" sermons. After church, Hiram was displeased to observe Obadiah embracing Abigail Harkness. (X-Men: Hellfire Club#1 (fb) - BTS) - Obadiah's friends Thomas and William greeted Hiram and Sarah Shaw on their homeward path. (X-Men: Hellfire Club#1 (fb)) - That evening, after Obadiah told his mother that he had been away with his friends Thomas and William after church, Hiram interrupted, telling Obadiah he had seen his friends heading to spend the lord's day with their families...like all good sons should. He then forbade Obadiah from seeing "that Harkness girl" again...ever. Obadiah refused, telling his father he didn't care what he thought of Abigail, as he was love with and planned to marry her. Hiram warned Obadiah that he courted his wrath, as he'd neither see his wishes ignored nor would he allow Obadiah to condemn his eternal soul to Satan's furnace for "the temptations of that filthy witch." Obadiah argued that she was not a witch and he couldn't prove she was, but Hiram turned his back and walked away as he asked, "Can't I...?" That evening as Hiram slept, demon arms pulled him into the Dark Dimension to the presence of its master, Dormammu, who welcomed him as "Sorcerer Supreme." When Dormammu vaguely warned what would happen if Hiram didn't stop barring his path into the material world, Hiram accused him of infecting the people of Salem daily with his magic, to which he would see an end. Shaw's mystic force bolt bounced harmlessly off Dormammu, who mystically bound and then taunted him as a pretender to his role as Salem's holy protector when instead he damned his own kith and kin straight to the eternal pit. Struggling futilely, Hiram professed to not understand, but Dorammu then showed him visions of the future, noting that his lust for power was the spark that would corrupt his descendents. Dormammu asked Hiram to submit to him and he might lighten the load on his descendents, but Hiram defiantly yelled, "Never!" and Dormammu returned him to his bed, warning they would meet again. Abruptly awakening, Shaw calmed himself, telling Sarah of the nightmare he had just had, only to find Sarah dead and shriveled, with spiders crawling out of her empty eye sockets. (X-Men: Hellfire Club#1 (fb) - BTS) - Burying Sarah, to cover his own involvement, Hiram accused Abigal Harkness of being responsible for Sarah's death. (X-Men: Hellfire Club#1 (fb)) - Abigal Harkness was arrested. (X-Men: Hellfire Club#1 (fb) - BTS) - Abigail was brought to (presumably biased) trial. (X-Men: Hellfire Club#1 (fb)) - At the trial, after Abigail was found guilty and condemned to be hanged the next morning, Obadiah vowed to save her; but Hiram told him that power demanded a sacrifice and that someday he would understand this. Obadiah ran off, vowing that he would never abide his father's ways. (X-Men: Hellfire Club#1 (fb) - BTS) - Obadiah broke Abigail out of her prison and fled with her on horseback, planning to take ship from Boston in the morning. (X-Men: Hellfire Club#1 (fb)) - The town was enraged, but none moreso that Hiram, who led the horseback pursuit, prepared to chase them through perdidtion's flames to save face in the community's eyes. As they closed in, however, Abigail revealed she truly was a witch, and she unleashed a fiery blast that bypassed Hiram but slew the other men with him. Though he could have saved his men and even stopped his son's escape, to do so would have revealed his secret and made him a target. As his son and Abigail disappeared in the distance, Hiram recalled Dormammu's words about him being the spark. (X-Men: Hellfire Club#1 (fb) - BTS) - According to legend, Hiram Shaw was never seen again. (Official Handbook of the Marvel Universe A to Z hardcover#2: Vishanti (fb) - BTS) - The Mystic reclaimed his title (which he may never have officially lost), presumably by force. (X-Men: Hellfire Club#1 (fb) - BTS) - Obadiah Shaw wrote "The Truthful Account of the Salem Witch Trials," opening with "I give this accounting of those terrible days to cleanse my soul of their ungodly taint, and to protect future generations from the pestilence that is my namesake..."
(X-Men: Hellfire Club#1 - BTS) - In recent years, Irene Merryweather obtained the book and traveled to "the haunted church" in Salem, where an unidentified priest shared the story of Hiram & Obadiah Shaw on the condition that she swore what he told her never left the sanctuary. After she departed, unidentified parties (presumably associated with Sebastian Shaw and/or the Hellfire Club) apparently shot and killed the priest (a gunshot was heard in the shadows after he found the gate unlocked, and then the story ended). Comments: Created by Ben Raab and Charlie Abalard. I enjoyed the X-Men: Hellfire Club mini-series with all the interesting characters and time periods they used, but they just seemed to finish short of resolution. I'd definitely like to see more of Hiram Shaw. 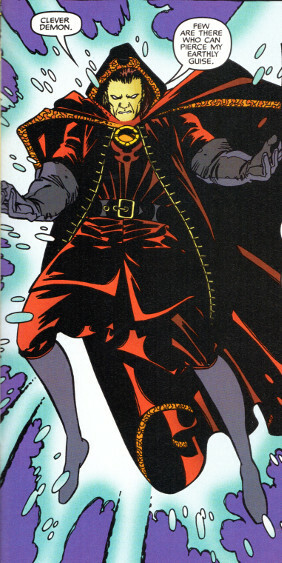 Circa the late 1680s, the Mystic <this was Yao, before he became the Ancient One> was, under unrevealed circumstances, apparently challenged for the role of Sorcerer Supreme by Reverend Hiram Shaw, an American colonist who himself fought Dormammu; however, despite acting as Earth’s protector, Shaw was nowhere near as benevolent as the Mystic and used his power to gain political prestige by persecuting witches. The Mystic soon reclaimed his title, presumably by force. The Official Handbook of the Marvel Universe A to Z hardcover #1 entry on the Ancient One also noted the above, but expanded the last sentence, saying: The Mystic soon reclaimed his title (which he may never have officially lost), presumably by force. Since we know that the title of Sorcerer Supreme is only officially given at the Time of the Vishanti (see the Vishanti profile for details), we also know that Hiram Shaw was never the official Sorcerer Supreme. Dormammu's mocking him as "Sorcerer Supreme" in quotations may support that, or Dormammu could merely have mocking his abilities as less-than-supreme. We don't really know whether Hiram actually directly conflicted with the Ancient One, or whether the Ancient One was somehow otherwise occupied off-Earth, and Hiram usurped his role (perhaps even with the Ancient One's support),...or perhaps something else together. Shaw seemed to possess what looked a lot like the Cloak of Levitation and some sort of Amulet (whether it was the Amulet or Eye of Agamotto in a variant form (or perhaps just looking different due to artistic license)), which would give some support to him having somehow replaced the Ancient One, but that was only shown when he was in the Dark Dimension, and I'm not 100% positive that wasn't just an astral form he adopted. We didn't really see him using the cloak or amulet. As even a perceived "Sorcerer Supreme," one might imagine that he had some alliance with the Vishanti, but it is also quite possible that he saw all the mystic beings invoked via exocentric magic as demons. There's really nothing to indicate either way, but my gut says the latter. It makes sense to suspect that Hiram Shaw started out as a straightforward minister who then decided to pursue sorcery to oppose those he could not reach via sermons and discussions. But we really don't know his origins. There's more Salem Witch Trial information on these pages (and sup-profiles): Charity Brown, Cotton Mather, Dark Rider, Abigail Williams, Betty Paris, and Way Wilcott, and, of course, Agatha Harkness. As clarified for long-term Appendix and OHotMU-writer and international expert Loki: The Kingdom of Great Britain formed with the Union of Crowns circa 1707, and became the United Kingdom of Great Britain and Ireland in 1801. Prior to that, Hiram, Sarah, and Obadiah would have been citizens of England. Goody Shaw was the devoted wife of Hiram. She became fearful when he was angry. Sarah searched fruitlessly for Obadiah when he did not return from services. When she asked him about it, Obadiah dlaimed he had been away with his friends Thomas and William after church, but Hiram interrupted, revealing he knew he had been with Abigail Harkness. When Hiram was enraged by Obadiah's defiance of his order to never again see Abigail, Sarah meekly stated, "Oh, Lord! Have mercy on us..."
After Hiram walked away, Sarah urged Obadiah to obey his father, and when Obadiah told her he could not deny his heart, she added, "Nor can your father deny his. He believes he is God's sanctioned agent, sent to punish the wicked for their sins." When Obadiah replied that without proof of her involvement in the dark arts, there could be no case against Abigail, Sarah hugged Obadiah and told him that she prayed Hiram did not find proof, for both their souls. That evening, as she and Hiram slept, Hiram was transported away by the mystic demon Dormammu. 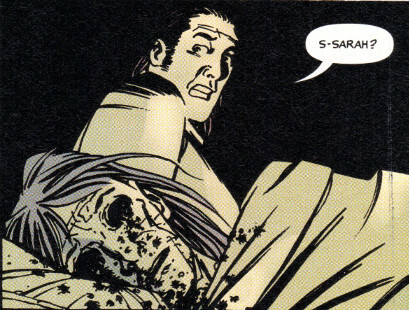 When Hiram defied the demon, Dormammu returned him to his bed, where Sarah now lay Sarah dead and shriveled, with spiders crawling out of her empty eye sockets. Shaw buried Sarah and then framed Abigail Harkness for her death.